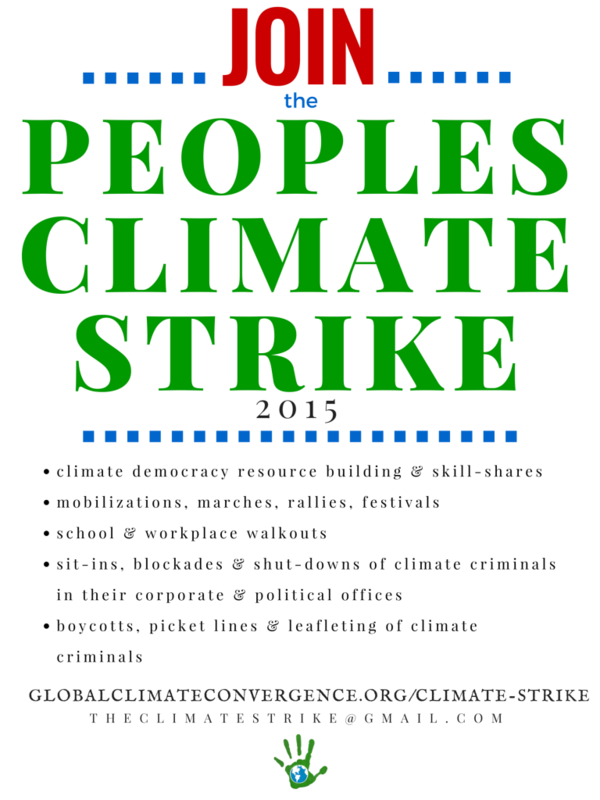 JOIN US in supporting the People’s Climate Strike by endorsing the strike and pledging to support at least one direct action supporting climate democracy and for Earth’s healing. Make a pledge for action now – because climate justice will not come from the same corporations and governments that brought us climate injustice. It will come from us – the Earth and her people! A People’s Climate Strike is being planned, with actions currently underway – to bring the engines of economic and ecological destruction to a grinding halt, demonstrate our growing power, and promote community-controlled, just, and green alternatives. The strike is intended to join workers, youth, immigrant and Indigenous, as well as racial justice, anti-poverty, climate and other activists in support of people, planet and peace over profit. It will take place in cities and villages across the globe in solidarity with the Paris protests against the final UN Climate Summit sell out, and continue on with climate strike action during Earth Day to May Day 2016. Organizers have been helping lay the groundwork by taking part in the 2015 Mother Earth Day / May Day mobilization, building a People’s Movement Assembly through the US Social Forum and connecting with local organizers through the Global Climate Convergence. 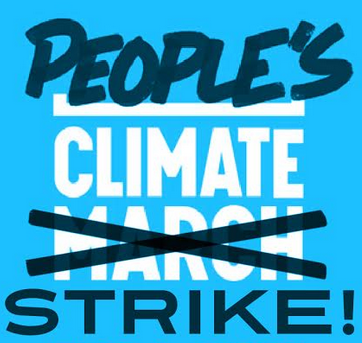 * OUTREACH to your network about the People’s Climate Strike by editing the People’s Climate Strike Sample Outreach Email, signing it, & using it as a tool to engage with your network. * ENDORSE the People’s Climate Strike by visiting our quick & easy to complete Endorsement Form on the GCC Website. * SHARE your plans for the People’s Climate Strike with the GCC network by uploading images through the GCC Image Uploader. Do you or your organization have resources (articles, videos, webinars, etc.) to educate and inspire action around strike goals and demands? * EMAIL [email protected] with links to resources, the partner organization providing the resources and an organizational contact. * RE-DEFINE “strike” more broadly by sharing news stories and analysis of strike actions to include civil disobedience, boycotts, work stoppages and creative community alternatives (like urban farms and credit unions, solar farms and public utilities, worker and community cooperatives, participatory budgeting, public banks and so much more.) Existing alternatives include hunger strikes, debt strikes, talking strikes and striking against the TPP – new ideas are being discussed & executed daily.